Retro comic book word collection. Noah - Comic book style male name. Super Wishlist - Comic book style word. I Love Ottawa - Comic book style text. Vintage Comic Book Lettering: SPLAT! 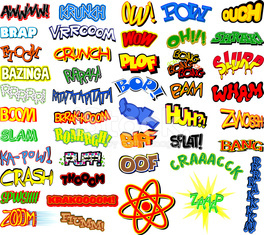 Vintage Comic Book Lettering: WHOOSH! Vintage Comic Book Lettering: POW!